But first, what we had for dinner! It was just a simple ol’ green Thai fish curry with rice. It was made as follows (serves 2): Put three handfuls of rice into a medium pot. Cover by a finger-joint depth of hot tap water. Put on the stove on high. Take a wide frypan, and add about a teaspoon of peanut oil. Put on medium-high heat. Once it has warmed up; add a heaped teaspoon of green curry paste. Stir it around to distribute. Chop up two smallish fillets of fish (Terakihi in our case) into biggish chunks, and add to the curry paste. Once the fish has browned off a little, add a small can of coconut cream; and simmer gently until the rice finishes cooking, adding additional water if required. Pile rice into bowls, and top off with curry. Melt butter in a pan, and add chopped bacon. 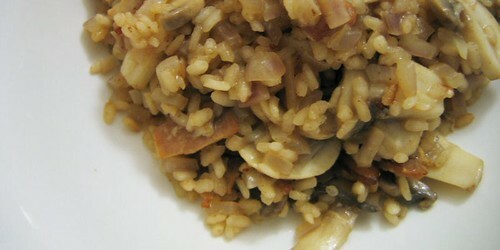 When the bacon is browned; add risotto rice (arborio or carnaroli), and fry until just starting to brown. Deglaze the pan with a couple of glugs of vermouth; then add finely diced onion and saute until translucent. If there is still fond on the pan (uh.. brown bits), use some chicken stock to deglaze further. Then, add enough chicken stock to just cover the rice. When the stock has evaporated off; cover the rice with stock again. This time, when the stock evaporates, add sliced mushrooms; and again, cover the rice with stock. When the stock evaporates this time; the risotto is probably ready. Sample a grain of rice, and if it tastes about right; stir in grated parmesan cheese and serve. Otherwise, continue adding and cooking off more stock until it’s finished. This is just a fairly standard sort of risotto. I trimmed the asparagus tips off for garnishing, and chopped the stems thinly. I finely chopped the zest of a lemon, and set aside the lemon juice for deglazing. As an underlying flavour base, I used 4-5 shallots diced finely. I blanched the asparagus stems in water, and once they were finished; cooled the water down with a block of frozen chicken stock from the freezer. In the main pan, I heated some garlic infused olive oil; and added the lemon zest. Once that was fragrant, I added the shallots. When the shallots softened, I added four small handfulls of risotto rice to the pan; which I gently fried until it started to get a little colour. At this stage, I deglazed the pan with the lemon juice. Once the lemon juice evaporated, I started to incorporate the chicken stock. When the risotto was about half complete; I added the asparagus stems to the pan, and moved the asparagus tips into the stock to warm through. 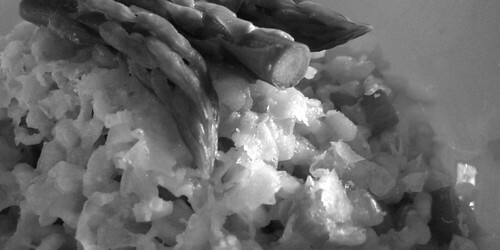 Once the risotto finished; I put it into a couple of bowls, and topped it with freshly grated parmesan and the asparagus tips. Next time around, I’m going to pass on blanching the asparagus – the idea behind that was to get some asparagus flavour into the chicken stock. It didn’t make that much difference flavourwise, and it was a bit brutal texture-wise.